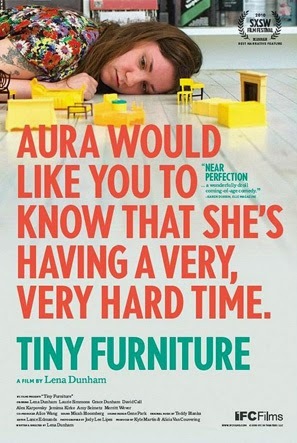 This month marks the new season of Girls returning to HBO, and to celebrate the occasion, our pick for January's Movie of the Month comes from Girls creator Lena Dunham's breakout film, Tiny Furniture. This 2010 film written, directed, and starring Dunham tells the story of Aura as she returns home to New York City after finishing college in the Midwest. It showcases her adjustments back to city life and trying to find her place in the world and reconfigure her life at home with her mother and sister. The film, which won Best Narrative Feature at SXSW in 2010, stars Duham's real life sister and mother in their respective roles as well as Girls actors Jemima Kirke and Alex Karpovsky before they landed big roles on that show. So, before everyone's favorite hipsters return to premium cable, take a look at the film that started it all and actually maybe a preamble for the latest season of the award winning show.